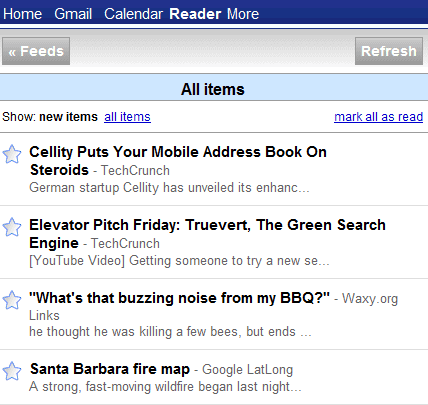 There are already two native iPhone apps for Google Reader and Google Calendar made by third party companies. Byline (for gReader) and SaiSuke (for gCalendar). Just when I think I'm too grown up to love Google anymore...they're like my new Santa. looking forward to see s60 optimized versions - those iPhone ones look quite well, but there are some displaying bugs connected with lower screen resolution (240px is not wide enough). Google is going to own the mobile web space. That's good news for all of us! Anyway to get these sites to work on Blackberry Bold browser? I guess the one that comes on the device is not a "modern" browser... anyone tried these with Opera? yes. I use them with Opera mini 4.x -> they work (almost) fine - no Ajax. Opera mobile should probably be better. I only wish that the iphone version of gmail paid attention to the width of the browser. On my n810 and here in google chrome it displays the site as a narrow strip like the iphone in portrait orientation. in iGoogle I have a comics tab for Dilbert and Peanuts comic gadgets but it doesnt display those comics on the mobile version. Unfortunately, there doesn't appear to be mobile support for the Google Apps version of iGoogle, the "partnerpage" links. The other Google Apps services seem to come up just fine in an iPhone-optimized format, but the actual personalized start page does not, even though iGoogle does. It does appear that iGoogle and Google Apps start pages are running a different code base, but I am wondering if the iGoogle features are going to trickle into the Google Apps world any time soon.... It's been over a year and the Google Apps partner pages remain as boring as ever in comparison to iGoogle. Google Apps partner pages use an outdated version of iGoogle, so I'd expect to be upgraded to the new iGoogle when it will be fully released. I haven't been able to find a way to edit my existing Google Calendar entries using my iPhone. Has anyone else had luck with this? Other than google reader why do the rest of the apps behave really weird on opera with htc diamond. For example the gmail app keeps scrolling to the top automatically and doesn't allow the user to scroll? The only downside is now that is works in the normal browser, but not in the sidebar. This is because GreaseMonkey does not support the Firefox Sidebar (http://groups.google.com/group/greasemonkey-users/browse_thread/thread/87351bce2c99d267). Anyone nows a trick to enable the sidebar with GM?